Anime Los Angeles (Los Angeles, CA). It's gonna be a good day in L. A. Good day, Anime L. A.! CSUF Arboretum Doll Gathering (Fullerton, CA). It's raining. It's pouring. The SD17's are snoring. Sakura Watch Lite (Van Nuys, CA). Division 5 gets bamboozled in the bamboo forest. Asahi Con (Antioch, CA). If you attend, you get a cookie. Seriously. Sakura Festival (Los Angeles, CA). Giant Inflatable Shark vs. Dogzilla. The battle begins in downtown LA. Pokemon Picnic (Fullerton, CA). Not necessarily the island of giant pokemon. SoCal Cosplay Spring Gathering (Fullerton, CA). Super boy and the invisible girl. Anime Central (Rosemont, IL). Last name Ever. First name Greatest. Cosplay in America Book Release (Culver City, CA). Recognize anyone you know? Fanime Con (San Jose, CA). Forget regret or life is your's to miss. Electronics Entertainment Expo (Los Angeles, CA). A gamer's paradise. Anime Night (Garden Grove, CA). Summertime karaoke blues. Welcome to Traveling - the Scarlet Rhapsody reporting team's collection of anime convention reports. Traveling was established in 2000 originating as a cosplay website with convention reports taking a back seat. The name originated from a Hikaru Utada song of the same name. The music video encompassed what anime conventions are in a nutshell - fun, spontaneous, and whimsical. 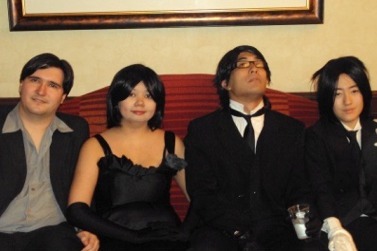 In 2003, the press team was created to cover anime events in the state of California. Tom (Kitsune Valentine) and Victoria founded the team during Anime Expo 2003. From 2003 to 2009, the group was named Traveling Valentine, an amalgam of both founding members' online names. Tom retired in mid-2009 and the reporting site went back to Traveling.The core team consists of Victoria, Stan, Jared, and Deb. Following the Scarlet Rhapsody mantra, "Our hobbies, our stories," Traveling documents the best of times and the insanity that goes on at anime and science fiction conventions and events. We sing. We dance. We cover things. Valley Gakuen Obon Festival (Sun Valley, CA). Pacific Media Expo hosts a cosplay contest and anime swap meet. Club Max (Los Angeles, CA). The Tokyo and LA club scene - to the max! Anime Expo (Los Angeles, CA). Living in a Japanese anime in the city of angels. Comic Con International (San Diego, CA) Epic con of epicness. Power MorphiCon 2010 (Pasadena, CA). It's morphin' time! Anime Vegas 2010 (Las Vegas, NV}. Hey, you guys ready to let the Vic fangirls out? Nan Desu Kan (Denver, CO}. We're on mountain time! RT25 - The Celebration (Van Nuys, CA). The show that inspired a generation of otaku. Long Beach Comic Con (Long Beach, CA). Back to basics. Pacific Media Expo (Pasadena, CA) Asian ambition. Coming Soon! ©2000-2010 Traveling is a Scarlet Rhapsody property. Design and layout by Victoria. Please contact via email (staff @ scarlet-rhapsody.com) if you have any questions or comments.